Venue: Sheffield Arena Date: Sunday, 13 December Time: 1900 GMT Coverage: Live on BBC One, BBC Radio 5 Live & BBC Sport website. We will be dedicating a day to one of the top 10 contenders from 2-11 December (in alphabetical order). 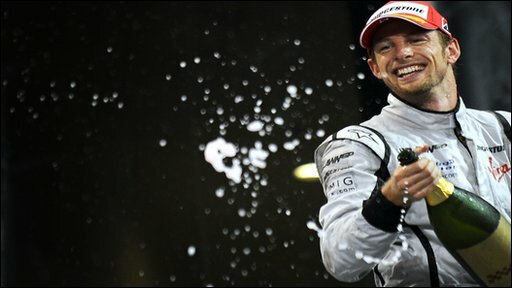 Jenson Button will never forget 2009. Only weeks before the season started in March, he did not have a car to drive - but by October he was Formula 1 world champion. Who will win Sports Personality? The 29-year-old made a blistering start to the season, incredibly winning six of the first seven grands prix, building up an unassailable lead thanks to a combination of brains and a Brawn car that was just too good for the competition. Jenson - who was 100-1 to win the title in January - had won only one grand prix before this season but is now the 10th Formula 1 world champion Britain has produced. Button's racing career began at the age of eight in karting, which is where he says he learnt to be a smooth driver. Three years later, the racer from Somerset won all 34 races he competed in to clinch the British Cadet Kart Championship. Success in British Formula Ford Championship followed before he was awarded his first Formula 1 drive, for Williams. Button eventually moved to BAR-Honda where he finished third overall in the drivers' championship in 2004 and two years later he raced to his first F1 victory, in Hungary, for Honda. BBC One & BBC Radio 5 Live.